WTH?! (What the Heck?) moments are attempts to find the memorable and the off-beat perspective on Longhorns sports. Here are some interesting moments from the Texas’ game against the Baylor Bears. Pregame WTH Floyd Casey?! Our game should be called the Battle of the Brazos (nod to the Red River Rivalry) since the fans were split right down the middle at the 50 yard line with UT fans taking up half the stadium. 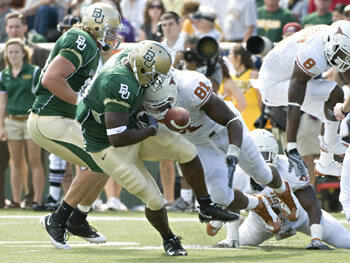 Should Baylor football still get their cut of the Big XII money pot with their contribution to stadium attendances? 1st Half WTH Fox Sports?! Please talk to the Texas coaches before you broadcast another game. The television truck kept asking for replays or studio updates that caused us to miss many of the Longhorns up tempo offensive plays. Heck, they even missed on (1st Qt. 9:30) Tre’ Newton’s 45 yard touchdown run for a game update. I guess replays are more important than live plays. 1st Quarter (7:38) WTH McCoy?! [tag]Colt McCoy[/tag] please leave the Baylor fans alone. You made a good decision to throw away the football on broken play. But your pass ear holed a young Baylor band girl. I am surprised Colt you even hit a fan with the attendance that was announced (44,372). 1st Quarter (7:34 & 6:46) WTH Novak?! Referee Scott Novak and his crew screwed up on back to back unsportsmanlike penalties for taunting on the Baylor defense. Both calls were horrible since Baylor was trying to stay motivated against the second ranked team in the country down by 21 points. Thanks Scott for legislating out enthusiasm at a college football game. 2nd Quarter (1:28) WTH Chykie?! A great forced fumble by [tag]Sam Acho[/tag] which caused the ball to roll around in the end zone. [tag]Chykie Brown[/tag] had the ball in his hands but could not come up with the touchdown recovery. Oh well, Chykie had a great game by leading the team in tackles with 8 and had a bone jarring sack. WTH Shout Out to [tag]Lamarr Houston[/tag] who had 2 sacks and was constantly in the Baylor backfield. 3rd Quarter WTH Beebe?! Big XII Commissioner Dan Beebe was brought in for filler time in the booth during the 2nd half of the game. Dan thought the current BCS system needed a little tweaking with adding the strength of schedule, but shot down the idea of a playoff or a plus 1 system to determine the championship. Maybe we need to add the conference commissioners with the university presidents who do not get it when nearly everyone wants some sort of playoff. Next Day WTH Monroe?! I know that we have all done some stupid stuff. I hope that D.J. Monroe’s lack of poor judgment (DWI arrest) does not end a great start to a college career. I’m all for second chances to those who deserve it. WTH Shout Out?! Thanks to the fans at Bucky’s Big Red Tailgate Company who hosted this Longhorn at the Wisconsin Badger game against Michigan. You guys truly know how to throw a tailgate party and take care of a Texas fan in Madison. Next up for the Longhorn’s is the final home game of the season against the Jayhawks at 7pm Nov. 21st.